Friday 21 , Saturday 22 and Sunday of April of 2017 is celebrates " NATURA- Spring Edition -2017 "traditional contest with more than 37 years of age in Madrid." NATURA-Spring Edition 2017 "is an exhibition unique in its genre and a classic of the offer cultural of Madrid" with the disclosure of them science natural through the admiration or acquisition of its objects natural from their different approaches and possibilities; ideas and materials for decoration of inside and outside ; teaching materials for educational centers; minerals, shells, fossils, insects, meteorites, etc., for a formative collecting; gifts original and unique; courses and naturalistic excursions, etc. This exhibition and sale of natural objects that has with the presence of more than fifty exhibitors national and of others countries European is cited usual not only of them amateur Madrid to this theme exciting, but of others many arrived of all them points of the geography national. This new exhibition is held as usual at the Novotel Madrid Center (former Hotel Convention) whose rooms have been recently renovated and modernized. 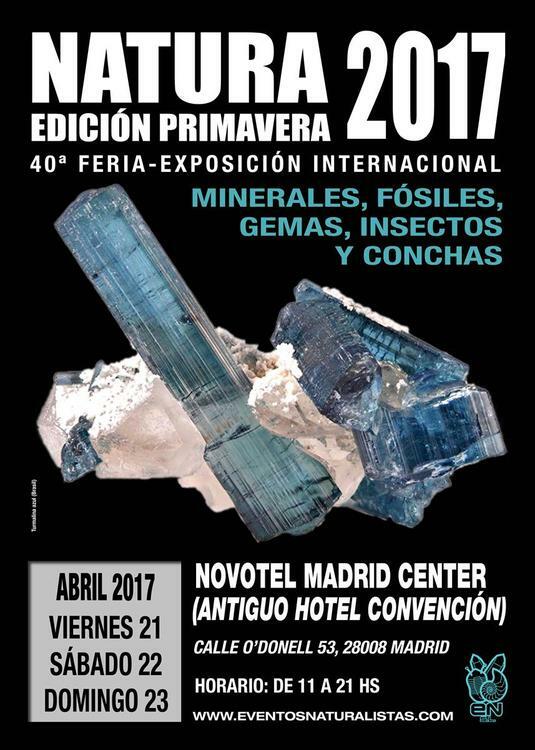 Natura is one of the most important exhibitions of the European circuit and imperative appointment on the calendar next to fairs as St.Marie Mineral in St. Marie Aux Mines (France) and Munich (Germany). Natura is as a large Museum of science natural, distributed in stands, where can observe or acquire all the news of this wonderful world. Within the activities of NATURA"Spring Edition - 2017" will take place the Conference: "Paleontology and adventure: seeking trilobites and other invertebrate fossils by mountains, jungles and deserts", presented by Dr. Juan Carlos Gutiérrez Marco, Doctor in Geological Sciences by the Complutense University of Madrid and one of those paleontologists more important internationally highlighting among its countless research the discovery of many deposits and fossil new as well as the obtaining of data key to the reconstruction of the missing continent Gondwana. The Conference is held the Saturday day 22 of April to the 13:00 hours in the salons of the Novotel Madrid Center (OLD HOTEL CONVENTION). "NATURA" Autumn Edition 2016 will have with them traditional sweepstakes daily of objects natural between the public valued in 3,000 euros also in this edition is going to give with a nice exemplary of mineral, fossil or shell to them 4,000 first assistants. You might consider posting this in the Calendar section, as well.